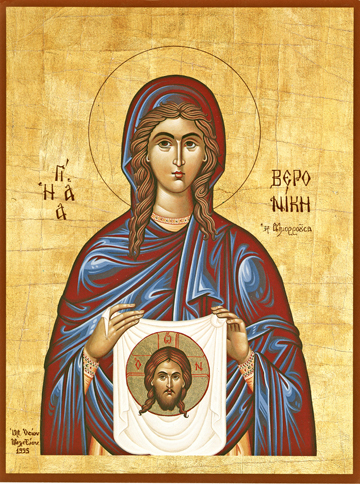 St. Veronica was the woman in the Gospel who touched the hem of Christ’s garment and was healed of her issue of blood, which had troubled her for twelve years. She was the niece of Herod. When Christ was carrying His Cross on his way to Golgotha, St. Veronica came up to wipe His face. An image of His face came off on her cloth, which is in some accounts identified with the cloth then sent to King Abgar. It is known as the Holy Napkin, or the first icon miraculously made by Christ, and called acheiropoietos, or “not-made-by-hands.” All icons of Christ are patterned after this first image, which predates the written Gospels. The name Veronica has two possible derivations. One is from the Macedonian name “Berenice,” which is from the Greek “phere-nike” meaning “bearer of victory.” In this case, when Latinized it became Veronica. In the other derivation, the Holy Napkin was known in Rome as Christ’s True Image, which came from the Latin “vera” and the Greek “eikon,” hence Veronica in the vernacular. May holy Veronica pray for us that we, too, may someday ascend to Heaven and behold with love the Saviour.